Finishing from Finishing Technology, Inc.
We're committed to providing a broad variety of high quality metal finishing services promptly and competitively to meet your fast-paced needs. Do you have too much compound (chemical) or media residue on parts? Are parts not clean? 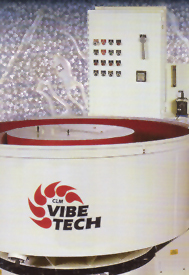 Or maybe you have excessive foam in your vibratory machine even though chemical concentration is low? New/used equipment - vibratory machines, barrels, etc.